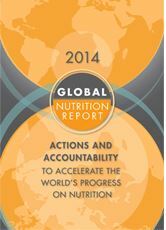 The first-ever Global Nutrition Report provides a comprehensive narrative and analysis on the state of the world’s nutrition. The planning, calculation, and monitoring application for food assistance programmes, NutVal 3.0 has an expanded database of commodities and products, and new population sub-groups to use for asssessing the adequacy of food assistance. NutVal is designed to run on Excel 2003 and later versions. NutVal was developed UNHCR, WFP, IGH/UCL and Global Nutrition Cluster. This blog hosts other posts related to the use of nutritional software.